A lot of online “legal services” are springing up, offering to perform comprehensive legal advice at a discount price. They tout their professionalism, and some offer “testimonials” citing how great their services are. While online legal services may seem like a bargain, the law is one area where it pays to work with trusted, experienced, highly competent professionals—lawyers you can actually meet, who want to build a relationship with you. This advice is more than opinion. Before they came to us, one of our customers learned that cutting corners with legal representation can be very expensive. It can also be disruptive and cause significant emotional suffering. One of our clients decided to draft his own estate plan, including his living trust. His goal was to evenly divide his assets between his children and his new wife. This gentleman was quite well off. He arrived in the U.S. as an immigrant and built a substantial business empire with his first wife, the mother of his children. He paid for a “virtual” consultation with a legal service lawyer, to confirm the plan and its components met his objectives and were complete. Yet, when he died, it was determined that the estate plan he drafted—the one his “legal resource” reviewed—did not accomplish his goals. Despite the best of intentions, he had made many mistakes along the way. Because he had no ongoing relationship with an estate attorney, no one informed him of his errors—or reminded him later of activities he needed to accomplish. As a result, after his death, his current wife initially received 99 percent of his assets, leaving his children with nearly nothing. Due to errors made in drafting the estate plan, the courts would not allow the children to challenge it. After lengthy litigation at great cost—along with stress and pain for the heirs, —we settled with the new wife. Turner Law helped the children gain ownership of the business—and approximately half of the estate’s assets. However, all the expense and heartache could have been avoided had he come to Turner Law initially. The deceased assumed that his current wife would transfer assets to the trust. 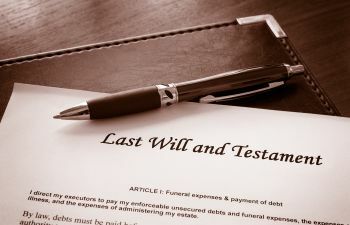 He further assumed that if she was unable or unwilling to transfer assets to the trust, they would automatically flow to the trust after he died. He also assumed the will would cover distribution to all beneficiaries. None of these actions happened, and there was no legal mechanism to ensure they did. Before his children realized what had transpired, he was no longer alive to set the record straight. Wills, living trusts, and estate plans in general are very complicated instruments. Making matters worse, they are processed at a time when their maker can no longer control the outcome. Online services may be great for some things, but they have no business in the legal profession—and especially in estate law.